Super rare alt cover of The Fiery Salamander. The Fiery Salamander is free for five days on Amazon starting tomorrow, April 15th. Get one (or 100) while supplies last! Well known French actors: Kiefer Sutherland, Charlie Sheen, Chris O'Donnell and Oliver Platt. 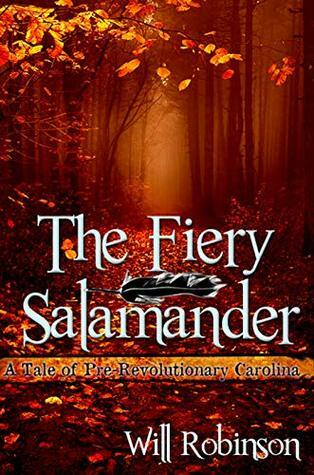 My novel, The Fiery Salamander, set during the end of the French and Indian War in the Carolinas is ranked #212 on Amazon in the category "French Historical Fiction". I think that is pretty magnifique. There are a few elements in the novel that speak on the influence the French had on the Carolinas during this period. First, there was a large population of French Huguenots that settled in Charleston and one of the characters, Zarina Michaux, is from that distinct ethnic group. Also, there is a French doctor character who is based on a real person of the same name, Jean Cantzon. Dr. Cantzon lived in the Carolina backcountry during this era and, in the novel, tries in vain to save the life of one of the main characters. Also, the Shawnee in the book are French speakers. At first glance, you might think that the ranking is a mistake, but when you look closer, it makes a lot of sense. I mean it's not the Welsh and Indian war, it is the French and Indian War. My Young Adult, Historical Fiction novel was featured on the NC Writer's Network's Book Buzz section. Go and check it out ​here. There are 29 free ebook copies of the Fiery Salamander available on Amazon until Friday, March 15. Get them while they last at this link! Luska, the scifi, space opera that took the universe by storm last year is going to be free on Amazon starting on Monday, March 4 and ending on Friday, March 8. Get one while supplies last! Also, starting on Saturday, March 2 and ending on Saturday, March 9, the stellar, historical fiction novel, The Fiery Salamander will be only 0.99 pence on Amazon.uk. That's not even one pound. Giveaway ends February 07, 2019. Get on Goodreads for a chance to win one of one hundred copies of my new YA, historical fiction novel, The Fiery Salamander. How could you not win? Well, I guess if more than one hundred people signed up, but come on that's not going to happen. And when you win, it'd be great if you gave me an honest review. The Fiery Salamander is now available. My new, young adult, historical fiction novel, The Fiery Salamander, is now ready to purchase in paperback or download from Amazon (only Amazon at the moment). Lovers of family sagas, history, adventure and the colonial period in the Carolina's (yes, very specific) will have the vapors over my new novel. It's a little bit Huck Finn/Winter People, a little bit Last of the Mohicans and a large bit of fun. Think about the movie the Patriot. Now think about that movie if it was good. I mentioned that the book was fun, yet living on the frontier in the 1760's was not a day at Six Flags (or Carowinds in my case). There was small pox, unrest, lawlessness, animals that bite, slavery and not a few Native Americans who were quite pissed off at encroachment on their land and many other insults directed at them by the swelling population of Europeans. I think you will enjoy it. That is enough verbiage- get the book yall. Really nice review from book blogger extraordinaire Tuesday Cross.